Dr. Keith Yimoyines completed his Doctorate in Naturopathic Medicine at the Southwest College of Naturopathic Medicine in Tempe, AZ in 2011. He has been in practice in Connecticut since 2011. His practice focuses on acute and chronic pain management, auto-immune disease and arthritis, digestive issues, allergies, and men’s health. Each patient is thoroughly evaluated with a thorough history, laboratory studies chosen specifically for each patient, and physical exam, typically including bio-impedance analysis of body composition. Each patient then receives an individualized, goal-oriented treatment plan which may include a combination of: nutrition and lifestyle counseling, detoxification, supplements and herbs, homeopathy, and acupuncture. His goal is to understand the physical, mental, and emotional goals of his patients, and work with them to achieve those goals. Optimal wellness is a lifelong journey, and Dr. Yimoyines strives to assist and support every patient in that journey. 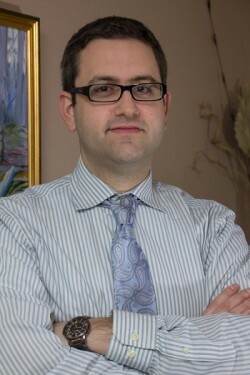 Dr. Yimoyines was born and raised in Redding, CT and has a Bachelor’s degree in journalism and history from Lehigh University. Before finding the path of Naturopathic medicine, his first career was in sports broadcasting.